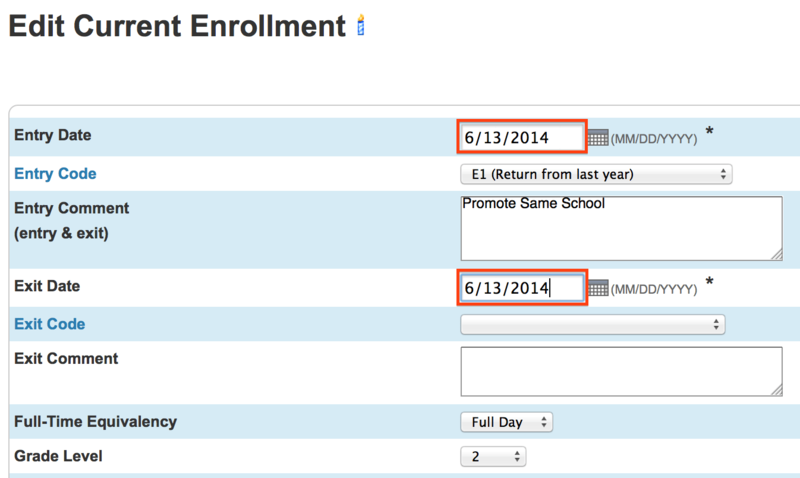 Step 2: Change the current enrollment start and end date to be 3 days after the exit date of the previous school year. New student no-show: This student went through the school’s enrollment process as a new student, but never showed up to the first day of school. This student has no prior enrollment history at the school. If this is your case, please see the article here. This article will walk through the process for exiting the returning student no-show. You can find this information in the student record under “Transfer Info” under the Enrollment category. Look under the most recent “Previous Enrollments”. The reason why the current enrollment is wrong is because the school year has not started yet the school year has already rolled over to the next year. In the case of the student above, the exit date of the previous school year is 6/13/2014. Remember this date. 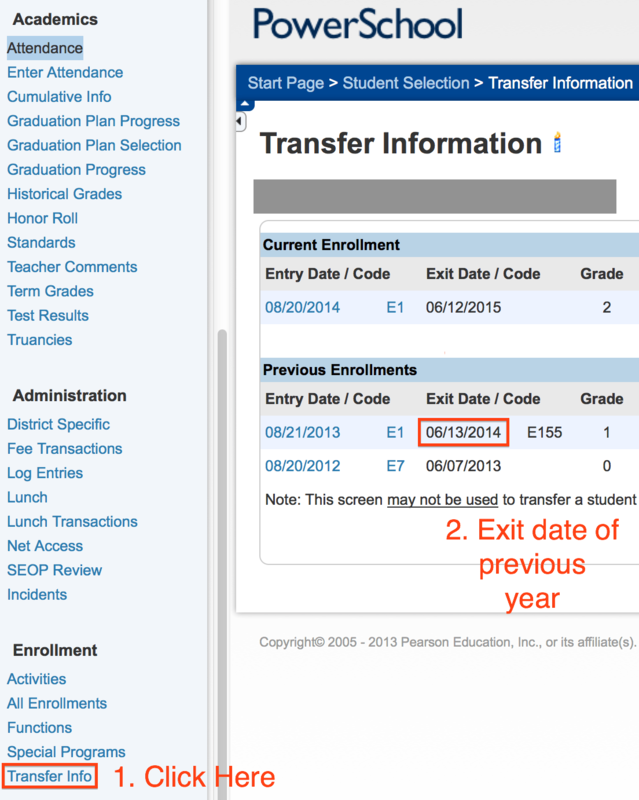 Navigating back to “Transfer Info” under the Enrollment category, we now change our attention to the “Current Enrollment.” It is here that we edit the records such that the Entry and Exit date are both manually changed to be 3 days after the date retrieved in Step 1 above. By doing so, you have a start and end date that finish after the last day of the previous school year. Specifically, for CALPADS (in California), this reflects an important update for no-show enrollments that occurred after July 1, 2015. 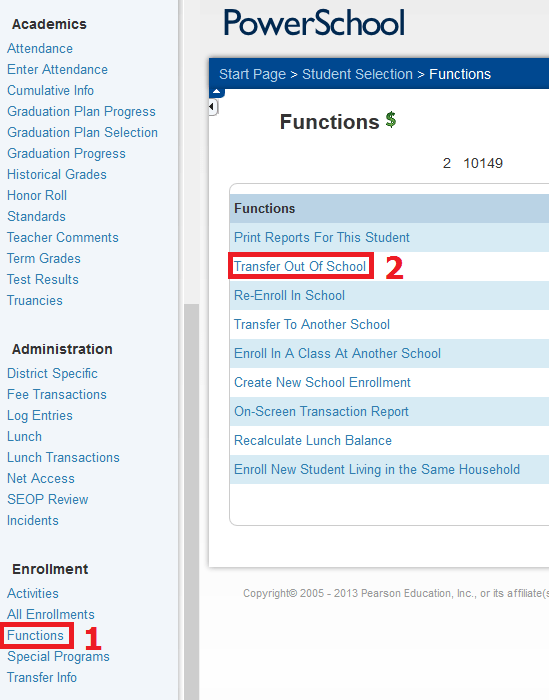 It also prevents multiple enrollments from being reported through the State SSID Report should you need to re-run any reports from the end of the previous school year. 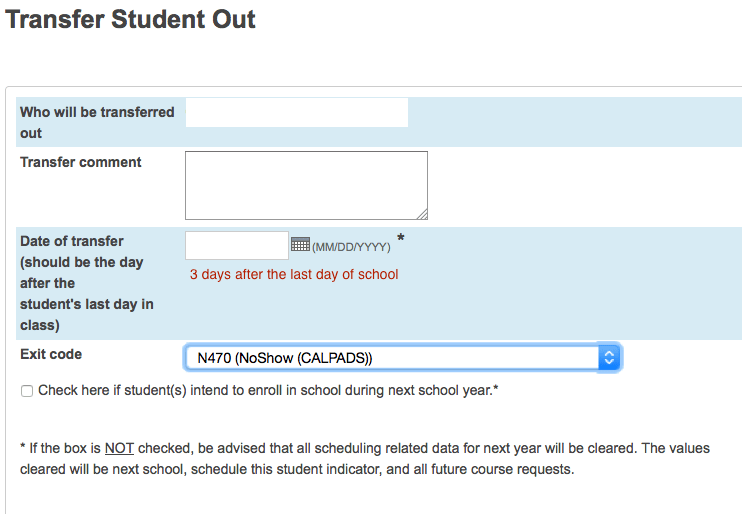 Now you can exit the student using the process that you would normally follow during the school year by selecting your student and navigating to Functions (Enrollment) > Transfer Out of School. Then exit the student using the exit date from Step 1 and exit code N470. For California Public Schools: Refer to the updated CALPADS documentation regarding No-Show Exit Codes and enrollment process to ensure CALPADS compliance.